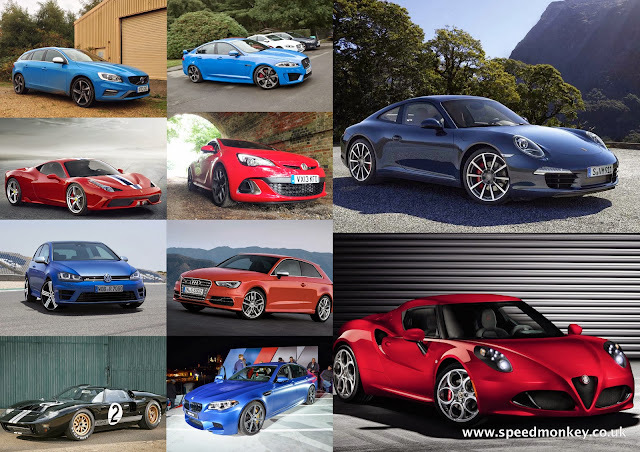 Speedmonkey: What Car Company Are You A Fan Of And Why? What Car Company Are You A Fan Of And Why? Many people like a particular car company. Be it Ferrari, Mercedes, BMW, VW, Ford, Audi or even Vauxhall. Even if we are not overt fans we often have a soft spot for a particular company. I've been thinking about this and, for me at least, the company I most align with is Porsche. Thinking about it further this is because Porsche reflects my personality quite well. I like a bit of risk, a bit of danger, but not too much. Porsches, being fast but solid cars, reflect this. I also like some flair and a little bit of outrageousness, but not too much. Porsche designs are sporty but also conservative. They are a bit out there, but not so out there as to be over the top. I also like comfort and home and Porsche interiors are dependably cosseting and familiar. You get in almost any Porsche and think, "Ah yes. Porsche." I've also got an OCD streak. I cannot cope with component failure and breakdowns. This is why I would love to love Italian cars but can't bring myself to ever buy one. Porsches are reassuringly dependable. Finally, I like to be different. To at least try and stand out from the crowd, and not really care what others think. Porsche has been ploughing its own furrow for decades, especially with the engine out the back in the 911. Its also realised it has to be populist in order to be successful, something I can identify with. So with that self-analytical cod-psychology out there please, do tell, what car company do you align with and does it reflect your personality?